Y'all really seem to love when I do more personal posts on the blog and I love that it is a way for y'all to get to know me a bit better. I have done a "Day In My Life" post once before back at the beginning of this past school year and y'all seemed to like that so I thought it could be fun sharing a summer version. While a lot of people crave the care free ability to have no schedule in the summer I've always done so much better with a bit of routine. While there is a lot of flexibility in my summer schedule each day tends to progress in the same manner. This summer I am working as a nanny for a family in my area who have three kids. Y'all I wish I had a video camera following me around daily because the conversations I have with them are hysterical and I know y'all would be so entertained. They have been so much fun and will surely have me laughing all summer long not to mention that this is the perfect summer job for me since it still provides me with plenty of time to blog and create fun content for y'all! Definitely a best of both worlds since I am able to hang out with kiddos I adore and blog all summer long. As for my schedule with them it tends to vary and our activities are always changing. When nannying I am driving to and from swim lessons, dinosaur camp, tennis lessons, the pool, the library, the park, and their house depending on what we want to do on specific days so I didn't go hour by hour when I am with them since there is no typical day (one of the reasons it's so fun to work with kids). illustrations via my favorite print artist! Are y'all like me with a love of routine or do y'all like to keep your summer schedule free? I'd love to know! Happy Monday! I am totally a schedule person. Even on my days off, I tend to want to be on the go and scheduling some kind of activity. Our daily schedules are so similar! I'm a nanny as well, I have 3 year old quadruplets and a 6 and 8 year old, so I TOTALLY feel you on the "I need a video crew following me around" feeling! Looks like you have a great schedule! My days are all so different that it is hard to keep a consistent schedule in the summer. So fun! I always nannied during my college summers and it was the best! One of the kiddos I used to nanny for is a little older than you and just got engaged! Crazy! So fun seeing your everyday schedule! Mine is all over the place right now but I'm sure it will change as the summer goes on! 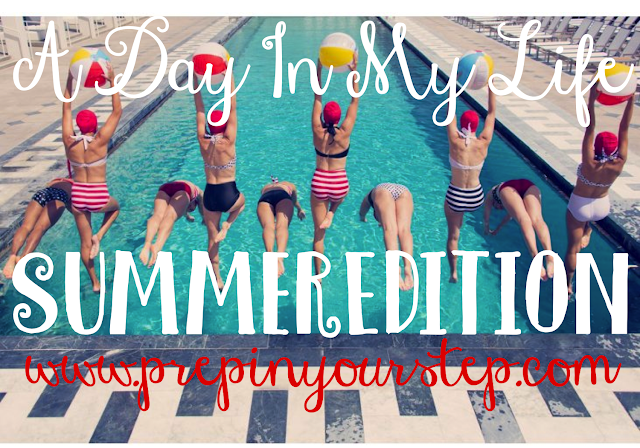 I love the freedom that summer entails, but like you-I tend to do better with somewhat of a routine! My mornings and evenings are always the same, but my afternoon changes from day to day depending on whether I have class (yucky summer classes) or whether I'm simply just cleaning the house! I love a solid routine too! If I don't stick to a schedule the day seems to get away from me and I don't get everything accomplished. Love this! And I think I prefer keeping my days free during the summer but during the schoool year I love a schedule to keep me organized. Love it! I always look on how other people go about their day. You definitely inspired me to start running!